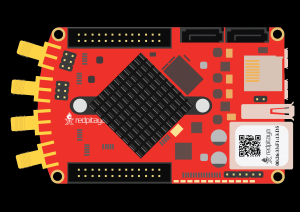 This example shows how to make a bar graph by controlling Red Pitaya on board LEDs. The number of LEDs that will be turned ON, corresponds to the value of variable p that can be set by MATLAB® slider bar. The code is written in MATLAB. In the code we use SCPI commands and TCP/IP communication. Copy code from below to MATLAB editor, input value p save project and press run. Change p with slider bar from 0-100. 'value'   , 10,...                           %// as set.